The summer is almost over, so it's high time I would present this single, Kaoma's summer hit from 1989. It is kindof tricky, because this song is cheesier than a Gruyere these days. When I bought it, it was still fresh, although it was already clear that it was becoming a bigger hit than it should. Twenty years later, you will hear this song regularly whenever and wherever you don't want it. In 1988 a French entrepreneur, Olivier Lamotte d'Incamps, visited Porto Seguro and discovered locals dancing the tightly syncopated lambada to a melody that turned out to be Bolivian. With a lot of publicity, d'Incamps originated a lambada dance craze, largely by promoting a European tour of Kaoma, a band formed from a Porto Seguro dance group Touré Kunda. He bought the musical rights of about 300 lambada songs. He went back to France, and created the Kaoma Band. They turned Lambada into a worldwide known style. 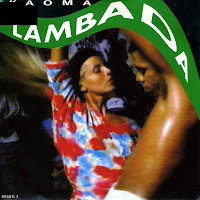 When Kaoma recorded 'Lambada' in 1989, it became a worldwide hit, reaching number 1 in several countries including the Netherlands. However, the song was an unauthorized translation of the song 'Llorando se fue' (1982) from the Bolivian group Los K’jarkas. Due to the clear act of plagiarism, Los Kjarkas successfully sued Kaoma.